Lima as the capital of Peru and is home to almost 10 million people, a third of Peru’s total population and is the only capital city in South America to have beaches. The two main areas where all the gringos tend to stay are Miraflores and Barranco. The former resembling one big shopping centre filled with high rises and shop after shop. The latter much more beautiful and bohemian. I opted for the latter and booked in to The Point Hostel. Arriving at 6am like after so many night time bus journeys, I find the party from the night before still giving strong in the bar. 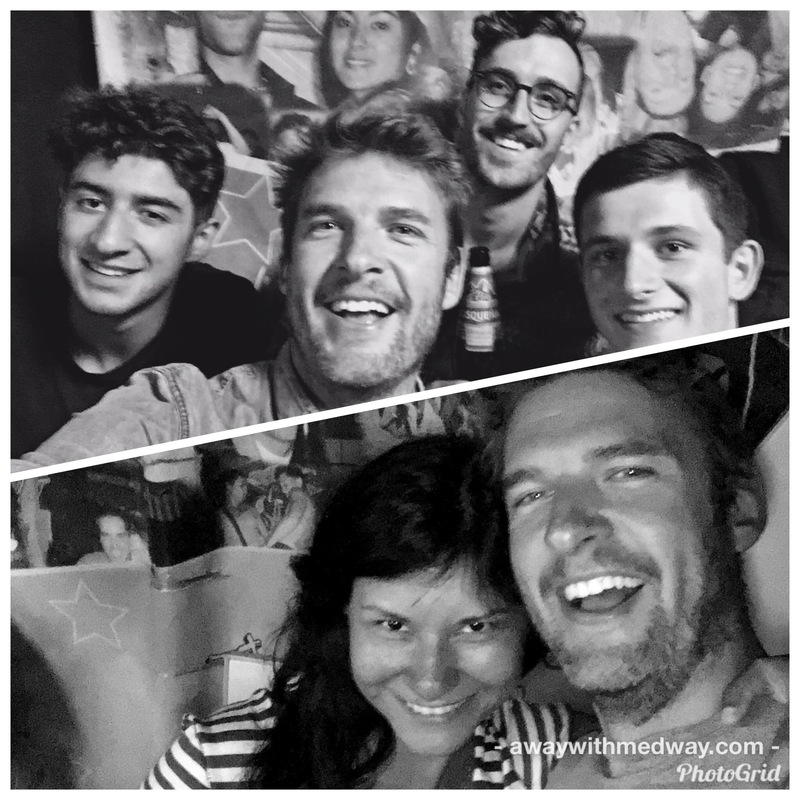 With a handful of people still standing, and celebrating Peru’s win over New Zealand in the World Cup. Meaning Peru will be represented for the first time in 36 years. Definitely a reason to still party and also it would seem for the government to declare a national holiday. I on the other hand declined the offer of a drink and headed to bed to get some extra sleep. Which I know is so unlike me – but joining a inhibirated group is never fun for the soba one. After a few hours of sleep, I explore the local area of Barranco. Full of beautiful old houses, that were once and some that still are owned by Lima’s rich. The majority now having been turned into a cool cafe, bar, restaurant or hostel, with some but not all having been lovingly restored to their former glory. 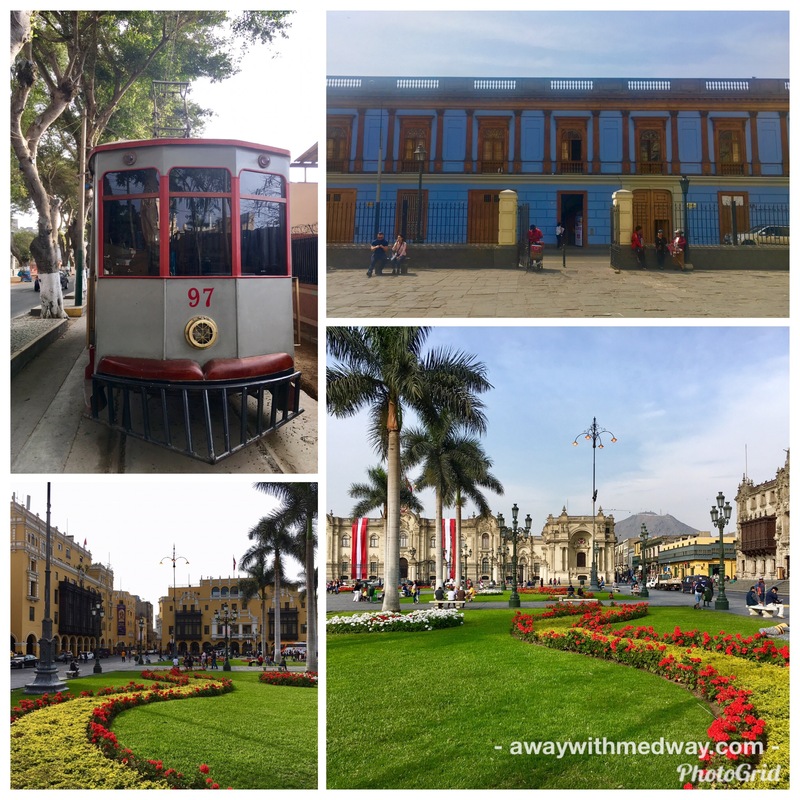 The next day it was time to see what else Lima has to offer, and make the thirty minute taxi ride to the centre and old part of Lima. 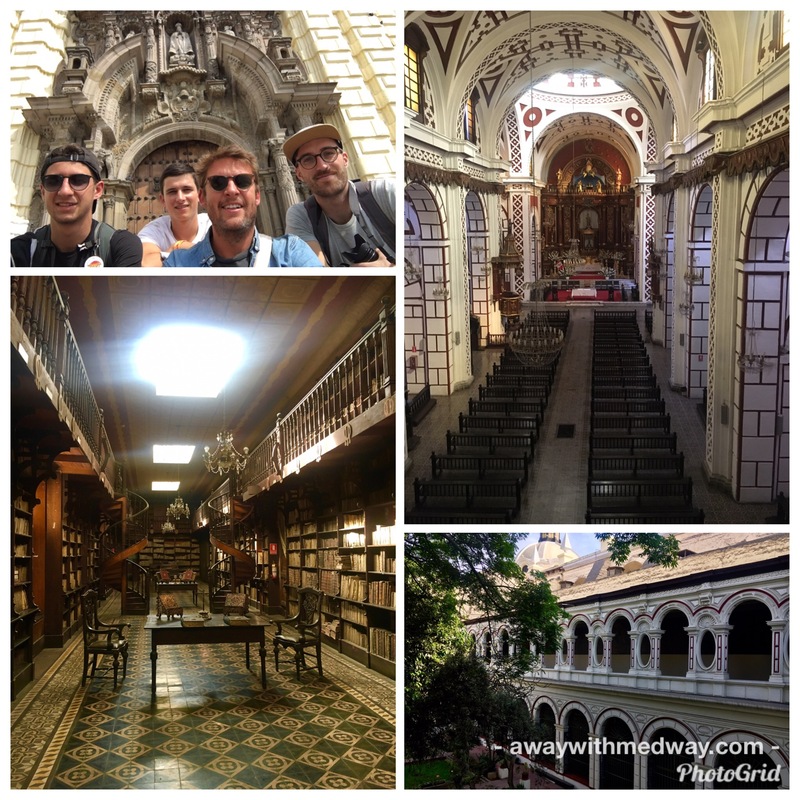 The German’s had also made it to Lima so they joined me in visiting the Basílica de la San Francisco and the catacombs. Apparently you are not meant to take pictures while visiting… maybe my Spanish is not as good as I thought, or i just didn’t care for the stupid rule. 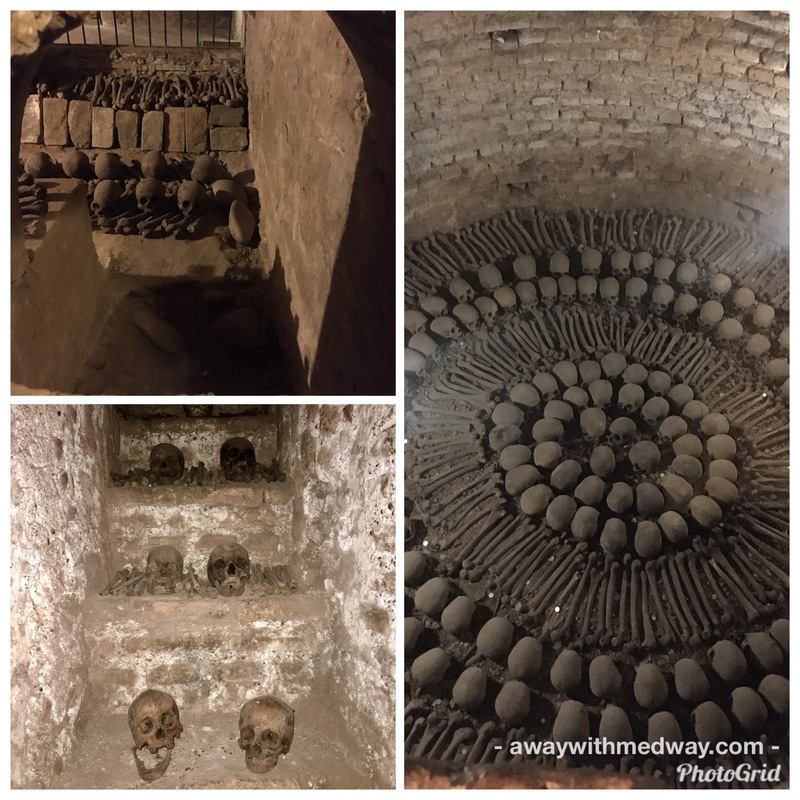 It was interesting and beautiful in places, and the catacombs were less eerie than I expected. Yes there were the bones of 50,000 plus dead people, but all I thought was what a cool venue for an event or club. Ooh and the delicious treat of Churros filled with vanilla or apple cream is a must afterwards. Simply called Churros San Francisco on Jirón Lampa a few minutes walk from the Basílica. Back in Barranco and feeling quite peckish, I decided to try Rana Canta restaurant that was recommended as being the best place for Ceviche and Peruvian food. The walls were covered in pictures of what I would guess are famous Peruvians who have visited, a really simple but pleasing aesthic. The food speaks for itself, with many options on the menu mainly including fresh fish, shouting eat me again and again. Which I would have if I’d had another stomach. Two courses was more than enough at around 45,000sol £10 a dish which was enormous. Ten weeks into my travels, my hair was in desperate need for a trim. But where would I find a good barbers in Lima. Well I thought “I would consult my trusty local guide app and ask one of the guys”. Turns out Mike from the US who lives in Lima, knows exactly where to go and with good hair I trusted his judgement. Cuppers 65 on the intersection Republica de Panama and 28 de Julio in fact reminded me very much of the typical barbers you find in Shoreditch London. Although they need a better waiting system, as one hour and half was a bit excessive, and the old guy keeping track was clueless. Me getting annoyed and making sure they knew I was, just isn’t the same in Spanish… I dont quite have the diva mannerisms down yet with the lingo. Dada bar was once a house for the rich, that has been restored and turned into a fantastic bar and restaurant, with a more formal setting on the rear terrace and informal bar setting with pizza at the front. But it wasn’t cheap, with cocktails at 25sol/£5, but they were like goldfish bowls of Gin and tonic which was perfect. I even had the choice of a cucumber or lime. After few gold fish bowls it was off to a pub that has live music most nights. Aptly named La Noche de Barranco, it is made of three floors – the basement where you find the live music, ground was just like a pub and the roof. Jugs of draft beer were freely flowing well into the early hours at only 70sol/ £1.60. I would have spent all night there is it wasn’t for the call of dance and the short walk to the Dragon Club, where more gold fish bowls were consumed and lots of dancing. My 6am wake up for the bus to Ica was not looking good. 6am arrived and I walked into the hostel to pack my things and clean my teeth and wait for the Germans to wake so we can get our bus to Ica, six hours South of Lima. I would just sleep on the bus… The Linea bus company was fantastic, one of the most comfortable yet and only cost 45sol/£10 to Ica. To be honest I had no idea what was in Huacachina, other than some sand dunes with an oasis in the middle. It was never on my original plan, but the Germans were keen and we were going the same way to Cusco. Arriving into Ica, we hoped into a tuk tuk for the final 5km to Oasis de Huacachina for 10sol. 3 guys and plus luggage in a tuk tuk was an experience to say the least, but we made it safely. 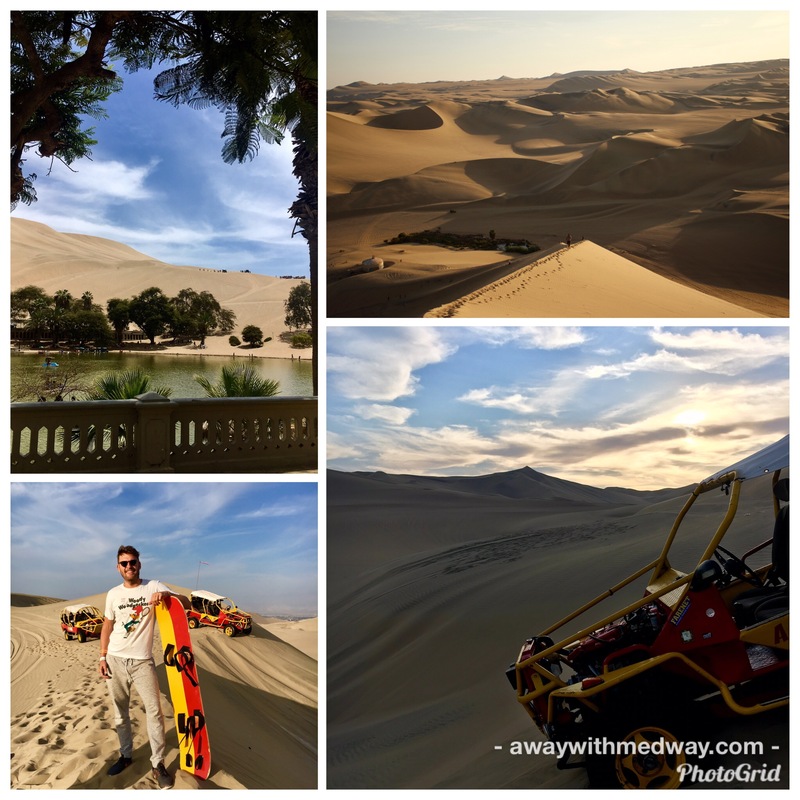 Arriving into Huacachina, I wasn’t expecting my breath to be taken away by size of the dunes, towering over the tiny little oasis. The pure white sand against the bright blue sky, was a sight you had to see for real to appreciate. These were not the same dunes I grew up with on the North Norfolk coast. These were mountains covered in sand. We checked into the lovely Wild Olive, a surprise favourite hostel of the trip. The breakfast was either omelette, eggs on toast or pancakes with juice and coffee. A real treat when it comes to hostel breakfasts. The main comunal area had the comfiest sofas and Netflix, it was like being in a cosy home. We booked our Sandboarding through the hostel for that afternoon, as its the best time to go, so you get to see the sunset over the desert. The dune buggy picked us upat 2pm on the dot – it’s what I would call a cross between a monster truck and and off road 4*4 with only a roll cage to keep you in. This was going to be lots of fun. The expanse of dunes goes on for miles and miles, all the way to the horizon. The buggy takes us up and down the dunes effortlessly, each dune getting steeper every time. You can hear screams from all round the desert as buggys bound around the dunes like a theme park rollercoaster. Sandboarding was fun, but don’t expect to be going down the dunes like snowboarding. No this is down on your front, head first over the steep sandy cliff. Again each new dune would be higher and steeper and your would go as faster as what felt like 40 mph. If you wish to sandboard properly, you can hire boards just like snowboards, but this is extra and you need to be with a proper instructor. After making the most of the hostel having a chilled second day, it was time to leave for another night bus and ten hours to Arequipa with Cruz del Sur – bagging my favourite seat number 4 – the boys sadly got a raw deal with the 2 behind that didn’t recline as much – note : never get the seats that back into the stairs. 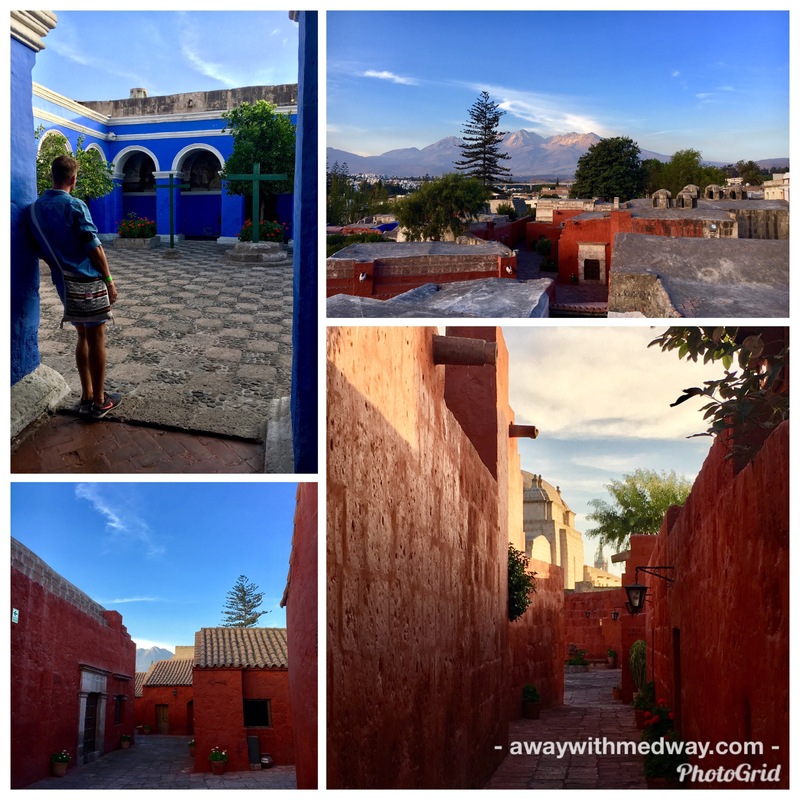 Arequipa was a real surprise and I would say the most beautiful city in Peru, also know as the ‘White City’ because of its white stone building and having the most non indigenous population in Peru. It also boasts to be the second largest city at one million, a fraction of Lima’s 11. Surrounded by three volcanoes that cover the beautiful horizon, and filled with lots of little gems to visit – this is a city not miss. The Santa Catalina Monastery was fascinating, which still has nuns living and practicing their faith inside today. It is a city within a city, built over 20,000 square meters of land that conceals the beautifully painted frescos and bright coloured courtyards and little homes that the nuns lived in, baked bread and made wafers. 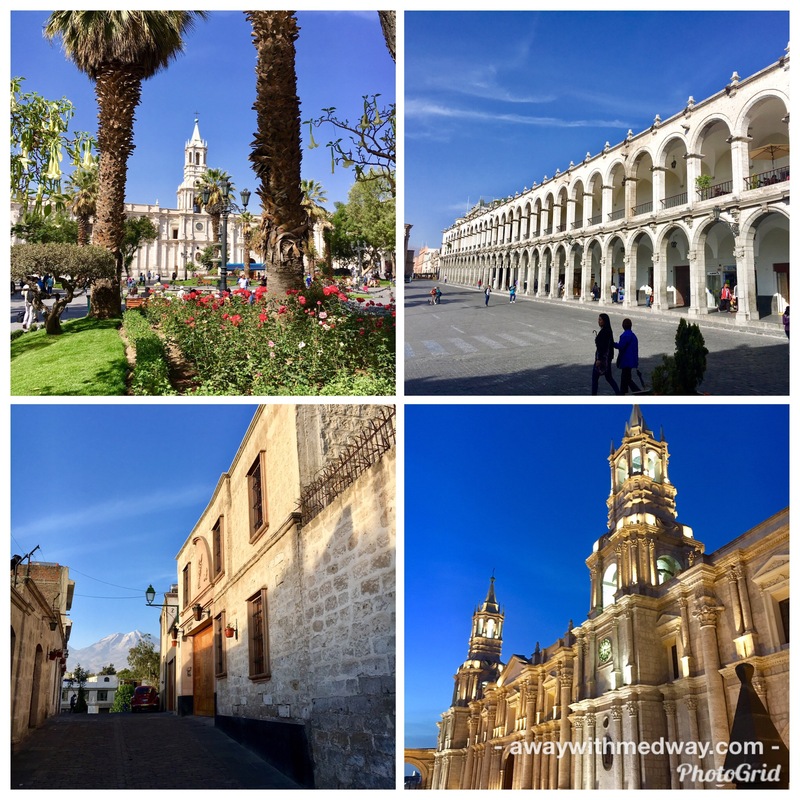 The walking tour was a great way to find out about the city, the history and how it became the second largest city in Peru. I wish I could have spent a few more days to explore more, but sadly Cusco was calling another nine hour bus journey to get there.